I went to the Cotswolds because I was looking for a place where time might slow down. With a mere three weeks before heading to the Philippines, I didn’t want to feel rushed. I wanted something slow, a place where you never had anywhere you needed to be, and where there weren’t lots of exciting options for things to do. Just lots of nature and relaxation. The Cotswolds is great place to go to slow time. Upon exploring Moreton-in-Marsh during the day, we discovered that most places close by 7 or 8pm. Additionally, many of these places close at midday for a few hours before reopening. I liked it. The whole Western demand for stores to be open 24 hours and through holidays can be overwhelming, and I was grateful to find a town that shut and sent its shopkeepers home to their families at a reasonable hour. It also meant that our evening options were limited to a) walking or b) going to a pub. A bit of green on the road out of town. 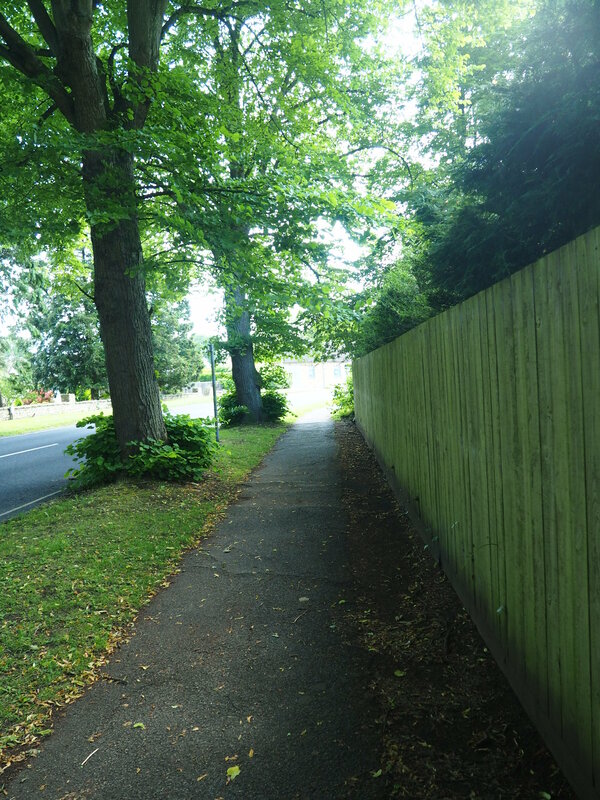 On our first full day in Moreton-in-Marsh, we explored the town. We did this in about an hour. The town itself springs up on either side of one main road; nearly all of the shops, pubs, and restaurants are located on this road, which does not stretch far in either direction. We realized that the dodgy pub we’d visited on the previous night was basically the town termination point in one direction. In the other, a Tesco marked the edge of town. Once we’d exhausted the main road, we ventured down every side street to see what off-the-beaten-path pubs and places hid down them, but there was nothing. Small homes and medical practices popped up here and there, but you don’t go on holiday to visit the doctor. We made a stop at Tesco to ship David’s laptop, which required Jamie’s packing expertise. I’m used to showing up at the post office at home and handing all the packaging over to the postman. (Or not. I may have been away from home for too long.) We purchased packing peanuts and a box, which Jamie packed, shipped it for under 15 quid (!!) and left. Our first stop was for lunch at the Bell Inn. A hotel employee had told us the night before that the Bell was where Tolkien had sat and penned Lord of the Rings, so I was dying to see it, if only to brag that I’d sat where he’d sat. The interior was unremarkable in the afternoon light, and the food was okay. The only nod to Tolkien was a giant map of Middle Earth on one of the walls. I suppose we could’ve asked about the history, but we were pretty hungry. 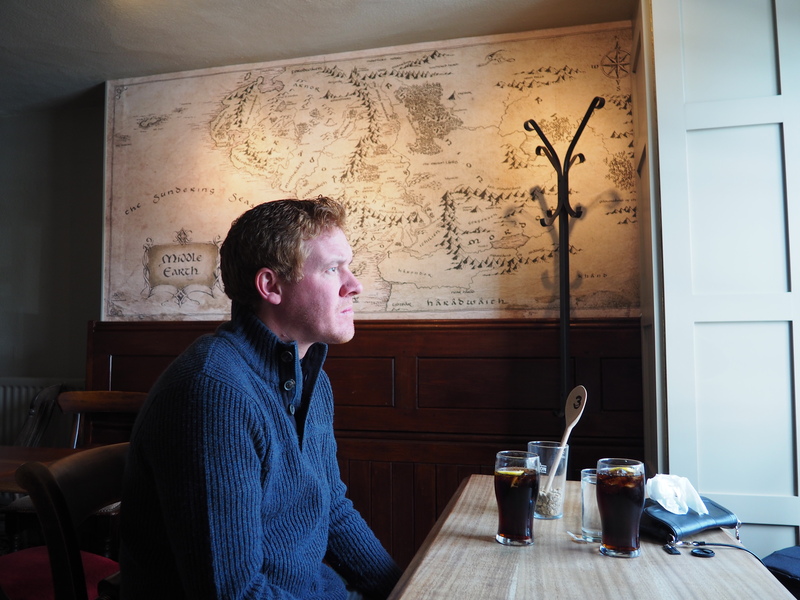 Jamie, at the Bell Inn, thinking about the origins of hobbits. After, we wandered the town, perusing shops, before settling at a small cafe called Marshmallow. Ian had told me that it’s obligatory in the Cotswolds to try cream tea. I, and Jamie for that matter, had no idea what cream tea was. Was it tea with lots of cream in it? Cream on top? A friendly woman greeted us and told us she’d be closing shop in 15 minutes, but if we wanted tea we could hang around. Jamie is not a tea or coffee drinker, nor does he particularly enjoy sweets. Cream tea involves most of those things. Apparently, it’s just a cup of tea accompanied by a fluffy scone and some jam and cream. You cut the scone in half and slather it with jam and cream. It’s delicious. Jamie even had half. 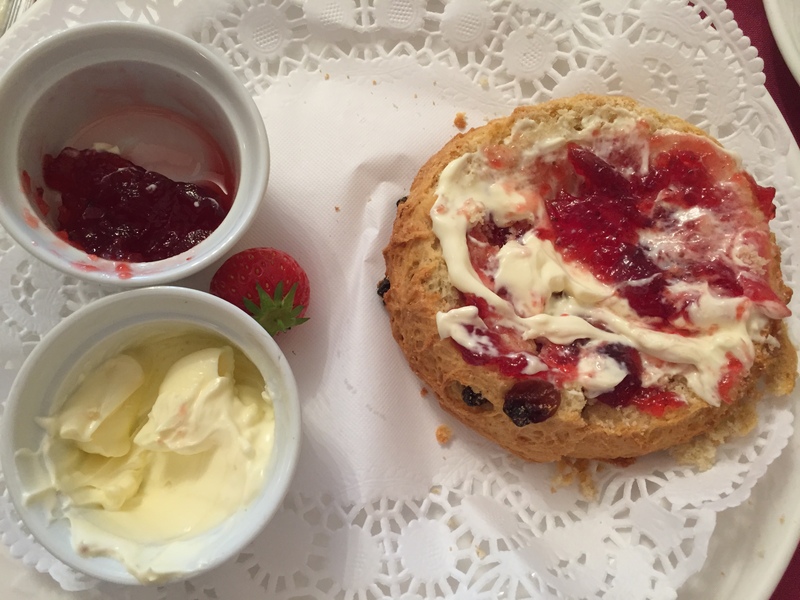 Voila – cream tea. A tasty breakfast in the Cotswolds. Feeling rather dazed from so much food and sugar, I required another walk. Jamie and I ventured out past the dodgy pub toward a country road that headed toward an arboretum and falconry. We probably could’ve walked to them, but decided to visit them the next day and returned to town. We ended up at another pub across the street from our inn where we dumped money into the pub quiz machine again and played until we won 6 quid. If this doesn’t sound exciting to you, I apologize. But for me, it was exactly what I needed. A whole lot of nothing. And Wimbledon. Wimbledon was on.